We are victims of our highly technological anthropocene, hopelessly addicted to novelty and speed. We hop from one latest upgrade to the next, never looking back despite the uneasy awareness that the discarded components of our electronic waste are leaching toxins like mercury, lead, cadmium, acids into our precious soil and waterways. In 2018, we humans tossed out our unwanted Iphones, PC’s, and all manner of electronic devices big and small to the tune of over 49 million tons of it world-wide. As reported our article Global E-waste: Scourge and Opportunity. Shockingly, e-waste accounts for 70% of all overall toxic waste in the United States. E-waste is a serious threat, but fortunately, there is presently some progress toward mitigation. New methodologies are being designed to reduce and eliminate human exploitation and the harsh environmental harm and carbon emissions associated with traditional metal extraction from both the earth and electronic waste. One significant actor in a new corporate ethos is Dell, Inc., ironically a venerable manufacturer of the very problem of e-waste proliferation. Despite being one of the largest multinational technology companies on the planet, Dell has shown a serious commitment to closed-loop sustainable practices for almost 15 years. In case you are unfamiliar with this brand, it was conceived in 1984 by Michael Dell. It develops, sells, repairs, and supports computers and related products and services world-wide. In 2004, Dell became the first company in the industry to establish a global consumer recycling-program. To facilitate their closed loop modus operandi, they focus on practical designs that take into account energy efficiency, require fewer materials, and build in ease of repair, disassembly and recyclability. Dell prides itself on responsible sourcing, and component materials often come from equipment recuperated from numerous drop-off locations like Goodwill Industries in the US. Dell mines its own waste stream. The closed-loop recycling supply chain involves a series of steps for device disassembly: sorting, shredding, melting and blending. There is incentive, private as well as corporate, to profit from some of the built-in precious metals that enable the conductivity we so depend upon. A ton of used motherboards has up to 800 times more gold than a ton of gold ore and dumped e-waste is estimated to contain over $60 million in gold and silver yearly, not counting copper, platinum and other precious and rare metals. But is there a safe way to extract it? The most common secondary extraction practices from recuperated electronic equipment uses a combination of hydrochloric acid and nitric acid which can have deleterious consequences. Other techniques using milder acids have also been developed with less potential to cause adverse effects to the environment. Online Youtube instructions can be found for individuals up for small kitchen-scale harvesting. Every method has its own degree of drawbacks, but Dell has employed a system that is comparably friendly to the environment. According to Trucost, a leader in risk assessment with respect to climate change, natural resource constraints, broad and social, economic factors, Dell has adopted an industrial scale recycling process that is 99% less harmful to the planet than the mining of virgin gold. 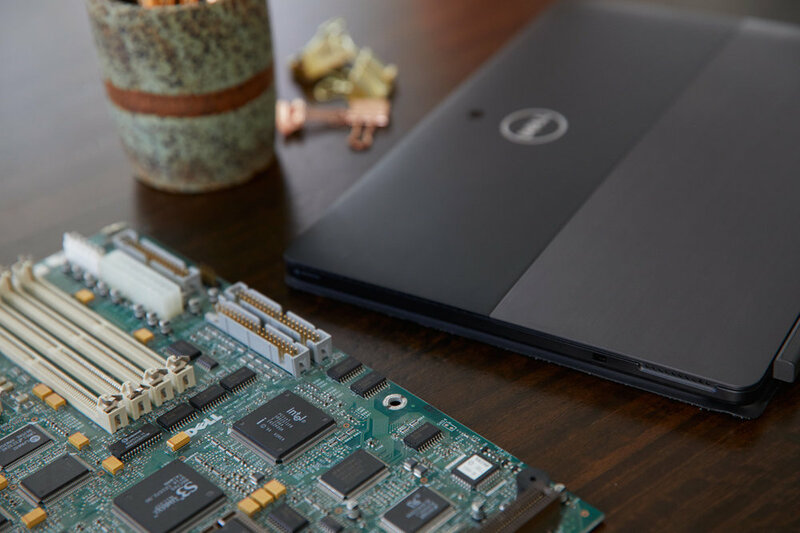 In January of 2018, Dell became the first PC manufacturer to use recycled gold from its own waste stream. Partnering with Wistron GreenTech, a recycling division of Taiwan-headquartered original design manufacturer Wistron Corp., they extract the gold from motherboards electro-chemically and then melt the gold into bars for easy transport to Taiwan who will use it to create a “gold salt bath. ” Components for new motherboards are then dipped in this bath to coat them. On average, Dell uses about seven thousand pounds of gold in its products every year and they expect to be able to manufacture millions of new motherboards with their own recovered gold. Who can argue with gold harvested from massive amounts of toxic e-waste that can be had with overall 99% less impact on the planet than mined gold? May sustainability rule! , collaborated with Dell on a new, limited-edition jewelry collection that’s made in the U.S. and made of gold from old, recycled computers. After a simply awesome handbag creation collaboration with Morgan Bogle, founder of vegan bag brand Freedom of Animals, Reed was bitten by the fashion bug big time and drew upon that partnership to start developing a fashion label called Bayou with Love. Nikki’s love for sustainability was paired with Morgan’s years of working with vegan friendly and ethical fashion, and resulted in a casually chic lifestyle brand that’s sure to set the world on fire. We also have developed a UL Environment-certified closed-loop process for recycling gold from e-waste back into new motherboards. That process can cause 99% less environmental damage than mining virgin gold. The circular economy is about more than just material choices, however. In the spirit of delivering technology with fewer resources used, Dell cloud services help customers scalably provision various types of technology for their workforce or their customers without tying it to new hardware. In many cases, this is also transferring work from larger form-factor devices (such as a desktop) to smaller form-factor devices, like a tablet, thin client or even a phone. Our product design efforts are guided by corporate environmental policy and we follow the ISO 14001 standard for managing environmental programs throughout the lifecycle. Product designers use the environmental guidelines to meet global regulations and standards, voluntary social and environmental initiatives, and eco-label requirements. We focus on environmentally responsible materials.